If you like truffle candies, then this dessert is for you. Actually, these are truffles, but only with small deviations. It is prepared very quickly, especially with my new system of melting chocolate. As a result, you will have a very chocolate dessert with interesting accents, which we will talk about below. Do it in advance, because these desserts have a rather long time of hardening (he will stand in the fridge for about a night). But you will be rewarded with a very delicate chocolate dessert for the expectation. 1. Melt 420-450 grams of dark chocolate, it is very important to take minimum70% of it, otherwise it will not just freeze. 2. Just break it into small pieces, add it to a bag or confectionery bag. Pour boiling water in high capacity and lower the bag there. Take out the bag and every couple of minutes slightly crush it, so that the warm chocolate around the edges mixes with the colder in the center. After about 5-8 minutes, you will have a uniform chocolate mass. 3. At this time, bring the cream 33% (200 g) to a boil and take away from heat. You can use saucepan, but you can use the microwave bowl. 4. You understand that by mixing cream with chocolate, you will get ganash. But this is another story. Separate three yolks and mix in the bowl with 40 g hot water. 5. Place the bowl in a water bath and hold for 2-3 minutes, stirring constantly with a whisk. The mixture will start to foam, but do not overdo it, or you'll get an omelet. 6. Pour the yolks into the mixer bowl and beat well for 3 minutes. 7. Pour the chocolate and mix again. 8. Stir, pour the cream. 9. Perhaps after the contemplation of whipped proteins, the second place is the mixing of chocolate. 10. The mold is with parchment, of course, it is most convenient to use rectangular (for bread or cupcakes). I used 8x25 cm. Pour the resulting mixture, carefully align with the spa and sprinkle with a large salt. 11. Do not miss this step in any case. Chocolate with salt is almost a classic. 12. And sprinkle them with pretzels, slightly drowning them in dessert. Clean the fridge for at least a night. These desserts based on ganache are very fond of staying in the fridge for a while. And we do not just cool it down, but let's see the structural connections (that's why we hold it longer than the cooling time). He will be really delicious in a day. 13. Cut the desired pieces with a hot damp knife and serve immediately. The dessert is very tender, it literally melts. If you want it to be more stable, increase the amount of chocolate for 100 g, but then it will not be so melting. 14. 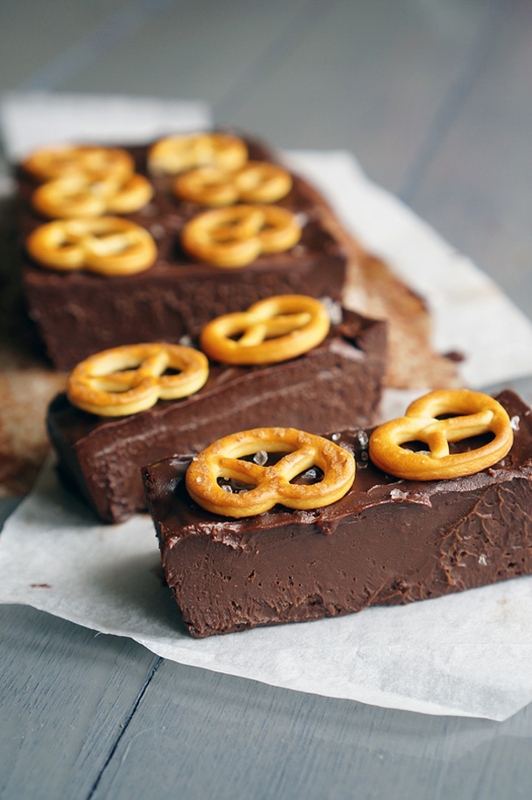 And, as usual, in the dessert you get different textures – a delicate chocolate base with crispy pretzels, in the taste there is sweet chocolate and salt – that's the contrast of contrasts.